In May of 2012, the Mayor of San Pedro Daniel Guerrero announced that the San Pedro Town Council (SPTC) would be installing no wake zone signs in various parts around Ambergris Caye. In addition, the council was also working on the logistics to declare the Boca del Rio area, from the bridge foot running reef-ward to the end of the channel where it meets the sea, a no swimming area. The two initiatives were in an effort to avoid major accidents where human lives could be lost. Now that it has been close to four months since the announcement was made there has yet to be signage or the enforcement of the designated “No Wake Zone” and “No Swimming” areas of concern. That’s because the signs are still being done. According to Mayor Guerrero, there has been some delay in creating the signs but he hopes that they will be ready by the end of September. Once the signs are ready, the onus to erect the signs will be on the San Pedro Tourist Guide Association (SPTGA). When the signs are erected, the SPTC, SPTGA and the Belize Coast Guard will be working to ensure that boat captains adhere to the signs. As it relates to the “no swimming” area near the Boca del Rio Park, Mayor Guerrero said that while there is no specific law prohibiting residents from swimming in the area, the SPTC will be installing signs to protect lives and prevent an accident. “We hope that when the signs are up, we will be able to conduct an educational campaign so that the residents can see the importance of having that area as a no swimming area,” said Guerrero. 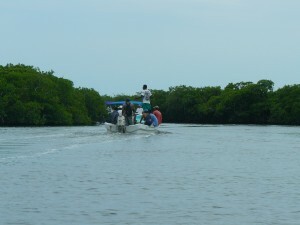 The area of the Boca del Rio around the bridge foot has been widely used by locals for swimming for years, but is also one of the areas that see a lot of boat traffic. In many instances, recreational users come in near proximity with moving vessels that traverse through the channel. But once the signs are up, the SPTC hopes that both the Belize Coast Guard and the Belize Port Authority will help regulate the area and discourage people from swimming along the channel. The entire coast line of Ambergris Caye is deemed a “No Wake Zone”, meaning that boaters by law are required to slow down to the point of “idle” speed while in that zone. This is, of course a law to maintain safety and prevent accidents.